Background: A new reflector antenna is proposed in this paper. The antenna is constructed from a semi-toroidal reflector, which is fed by a circular loop antenna (CLA). 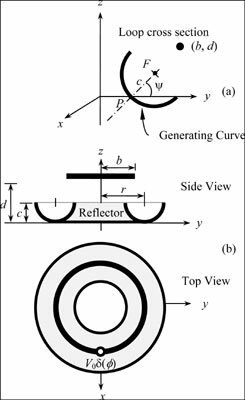 Method: The input impedance, reflection coefficient, directivity, radiation patterns, current density on the reflector and current distribution on the loop for different geometries of the proposed antenna were investigated theoretically in this paper. It was found that at resonance frequency, a larger directivity than that of a loop over a ground plane can be obtained. These antennas can give a directivity approaching 12 dB with reflection coefficient less than -10 dB. Furthermore, a reflection coefficient of about -24 dB can be obtained with directivity of 8.3 dB. Result: On the other hand, when the cross section of the semi-toroidal reflecting approached zero, the behaviour of the antenna was similar to that of two elements array of circular loops. Circular loop antennas, conducting bodies, current density, directivity, reflection coefficient, semi-toroidal reflector.